Ninja Star – 5 Reel, 25 Payline video slot with Stacked Wilds, Triple-Payout Free Games, Bonus Features, and 2 random Progressive Jackpots. Enter the daring world of Japanese Ninjas as they fight for justice set against the blue-black skyline of an ancient Japanese temple. The Ninjas must defend the treasures inside the temple. Samurai Ninja, Swords, Temples, Ninja Star, Scroll Logo, and high value cards A, K, Q, J, 10, 9. Coin sizes range from 0.01 to 5.00 per payline. On a 25-line bet, bets can start from 0.25 up to 125.00 per game. The Ninja is a grouped Wild symbol appearing on Reels 1, 3 and 5. The Ninja substitutes for all symbols except scattered Ninja Stars. This also means it can substitute for the Logo symbol, and activates the Ninja Scroll feature when 3 symbols appear on Reel 1. Ninja Star is the Scatter symbol and helps to activate an extra games feature. 3 or more scattered Ninja stars activates the Free Spins round. Multiple Ninja Star Scatters pay anywhere they land, regardless of the payline. Free Spins will be activated by 3 or more Scatters anywhere on the reels. Initially, 8 free spins with a 3x win multiplier will be awarded. These Free Spins can be re-triggered and award triple-payouts. 3 or more Scroll Logos from left to right from Reel 1 will launch this feature. Select one of the flashing Scrolls and the Ninja will appear, opening one of the scrolls to uncover a "Pick Again", "Next Level" or a "Feature Over" choice. The upper level of Scrolls always contains prizes; the bottom level is the decision maker. 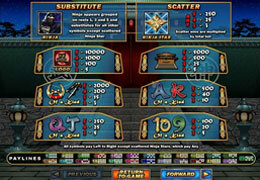 Play up to 3 levels, with each level award higher prizes. The bonus feature will end when the "Feature Over" scroll is uncovered. There are 2 Progressive Jackpots, the Major and the Minor which can be won at the end of any real-money game. The jackpots are triggered at random so the only way to win them is to play! 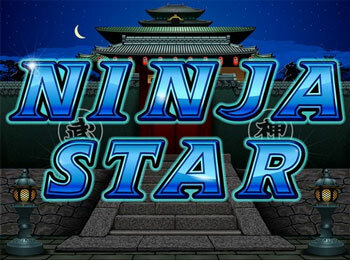 Ninja Star slot promises to be a popular choice with the game's randomly triggered jackpots, many features and top prizes. The theme is exciting with a touch of intrigue and adventure.